Ronson Frank’s Uprising Promotions will be returning to Club Amazura on Friday, December 7, with a loaded fight card that is already close to a sellout. Headlined by a bantamweight attraction that features Elton Dharry (23-5-1, 14 KOs) against Alex Rangel (17-8-3, 11 KOs), this entertaining night of boxing will be presented by Uprising Promotions in association with New Mexican Promotions. “The marriage between Uprising Promotions, New Mexican Promotions and Club Amazura has been a great relationship for each of our companies, and we are looking forward to hosting one more show to close out the year,” said Ronson Frank, President of Uprising Promotions. In the feature bout, Brooklyn bantamweight Elton Dharry (23-5-1, 14 KOs) makes his return to the ring to take on Alex Rangel (17-8-3, 11 KOs) of Mexico. After starting his professional career with a 3-5-1 record over his first nine bouts, Dharry has since rattled off 20 consecutive wins, most recently earning a unanimous decision victory over Oscar Mojica on an Uprising Promotions show this past May. He faces a gritty veteran in Rangel, who has proven to be a very tough out during his 28-bout career. Also returning will be former International WBF World Super Featherweight and interim IBA World Super Featherweight titleholder Ronica Jeffrey (16-1, 1 KO), who ended a two-year absence in brilliant fashion this past August on an Uprising Promotions card, winning in the main event over a game Gabriella Mezei at Club Amazura. A highly-popular and well-achieved Brooklyn native, Jeffrey looks to continue her winning ways when she meets hard-hitting veteran Edina Kiss (15-8, 9 KOs) in a scheduled six-rounder. Kiss has fought a who’s who in women’s boxing, including bouts against Heather Hardy, Cindy Serrano, Amanda Cerrano, Shelly Vincent and Mikaela Mayer. 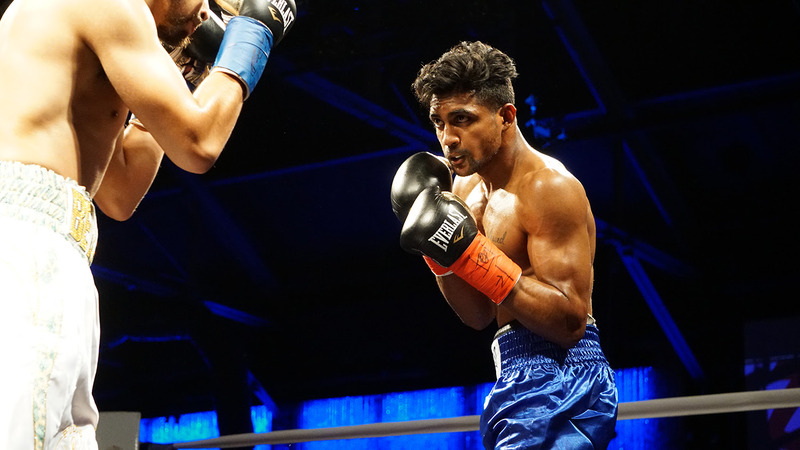 Undefeated super bantamweight Ariel Lopez (10-0, 6 KOs) will return to action on the December 7 card, taking on 13-bout veteran Jeno Tonte (9-4) of Hungary. A native of Puebla, Mexico, the crafty Lopez will be looking to keep his perfect record intact as he enters the ring for the third time in 2018. This bout also marks the third consecutive time and fourth overall that he has competed on an Uprising Promotions show. Another unbeaten super bantamweight will be on this card, as Jose Gonzalez (10-0-2, 3 KOs) meets veteran Andre Wilson (15-12-1, 12 KOs). Gonzalez returns to action after defeating the aforementioned Tonte this past August at Club Amazura, and he fights on an Uprising Promotions show for the third time over his three-year career. Rounding out the 10-fight show will be six more action-packed bouts. Popular Irish welterweight Noel Murphy (12-1, 2 KOs) and super lightweight Larry Fryers (8-1, 3 KOs) will appear in separate fights, with Murphy returning to action for the first time since suffering his lone pro defeat to undefeated prospect Mikkel Lespierre in February, facing off against Andre Byrd (6-4-1, 1 KO). Fryers is back in the ring for the fourth time in less than eight months after fighting on the last Uprising Promotions card at Club Amazura this past August. He will battle 14-fight veteran Ronald Rivas (5-7-2, 3 KOs) of Guatemala on the December 7 card. In four-frame action, super featherweight Harrison Barba (1-1, 1 KO) meets Ricardo Arias, while welterweight Paul Anthony (2-0, 1 KO) takes on Ramiro Cibrian. Additionally, Brooklyn welterweight Raymond Wilburg is slated to make his professional debut against Brandon Lindsey, and undefeated welterweight Peter Dobson (9-0, 5 KOs) is currently slated to compete against an opponent to be named.